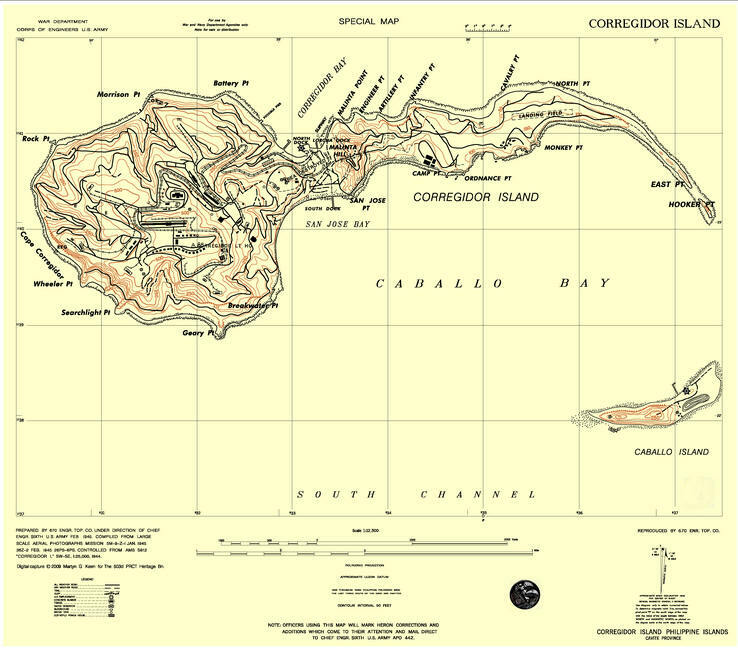 �THE 1945 CORREGIDOR "JUMP MAP" - This is a faithful DIGITAL reproduction of the map prepared by 670 Engineer Topographical Company under the direction of the Chief Engineer, Sixth U.S. Army in February 1945. The original map was compiled from large scale aerial photographs taken on Mission 5M-9-Z-1 JAN. 1945. It is professionally redrawn as a single *.pdf sheet by our Mapmaster, Martyn Keen. The map was issued to officers of the ROCK FORCE and was the only large scale map made available to them for the Corregidor Operation. In a decision of almost unparalleled stupidity, the Army considered that the accurate pre-war maps, being still classified as SECRET, should not be made available to the men who would be sent there to join battle. This notwithstanding that the Japanese could safely be assumed to be fully familiar with the topography of their own island! This single sheet map can be printed to any size. For best results, we recommend printing on a plan plotter at 1:12,500 on an A1 sized (841mm x 594) sheet of paper. It also prints quite well on an A3 sheet size. On an A0 sheet (1189 X 900) print to maximum scale of 1:6000. Delivery via e-mail will be as a *pdf file with your surname as password. Printing is best accomplished using a drafting plotter, however to print a section of interest on an A3 printer, zoom into the required area and print with the "Page scaling" set to NONE. The whole file can also be printed on a number of A3 sheets using the TILE ALL PAGES setting. Normal printing of reduced images can be accomplished on ANY printer using Adobe PDF settings. The map is redrawn as printed, not as issued - it does not contain the hand-drawn disposition and strafing-line markings. It contains copyright data and Heritage Bn markings not originally printed. The *.pdf file is edit locked. We are not making purchase of the map automatic yet (because I have forgotten how, and need professional help, remember?) So, until we can work it all out, click on the e-mail address below and you'll be taken to the secure Paypal site. The donation for this map ITEM#JUMP-01 is $20. Your surname will be the password for the file which will be e-mailed to you. At RockForce.org, I have been going through the S-3 reports and notice that coordinates 32.7-40.7 are for the Ice Plant. Numerous other coordinates are also listed but not near any structure to use as a reference. Would anyone know how to correlate this style of military coordinates to their specific location on this map? What map has this type of grids? The coordinates you are looking at were used on the 1945 Jump Map, which the 503d PRCT used on Corregidor. The Philippine Polyconic Grid (PPG) was placed, as a reference, on these maps. The paratroopers used the grid on the map during the battle and after to illustrate their reports. The PPG was based on a projection of the curved surface of the Philippines, projected as a conical shape - hence the name. The grid on the Jump Map is in thousands of yards and is a measure of yards East and North of the datum. The grid was notated along the western (left) and southern (bottom) edges of the Jump Map. The coordinates you gave for the ICE Plant at 32.7 - 40.7 is an abbreviation of the PPG coordinates. The unabbreviated PPG coordinates would be 832,700 yards East, 1,740,700 yards North. On the Jump Map the last three digits were omitted. Using this coordinate system on Corregidor, the first numbers were usually omitted (that is the 8 and the 17). These latter portions of the coordinates were unnecessary as they refer to 8 hundred thousand and 17 hundred thousand yards East and North respectively. For the last three digits of the coordinates the paratroopers would have used a 12,500 Scale with their Jump Map measuring from the nearest grid line to the west and south. These measured distances were all less that 1,000 yards and were added to the abbreviated coordinates as a decimal of 1,000 yards. 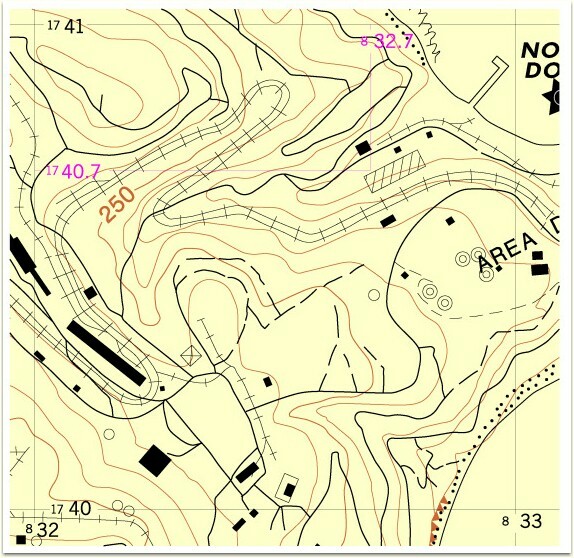 Above is a copy of a portion of the digital Jump Map of the area of Engineers Ravine. I have marked the coordinates of the PPG along the western and southern portion of the grid. It can be seen the Ice Plant lies between 832 and 833yards East; and 1740 and 1741 yards North. The Ice House, marked as a hatched rectangle, is approximately 700 yards east from the 32 grid line. 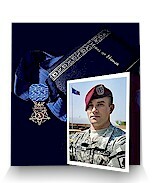 Therefore, the coordinate would be 832 plus 700 yards or 832.700 (as the paratrooper recorded them) or 832,700 yards East. Similarly, the Ice Plant is approximately 700 yards north from the 40 grid line. Therefore, the coordinate would be 1740 plus 700 yards or 1740.700 (as the paratrooper recorded them) or 1,740,700 yards North. I've marked the example coordinates in purple. You will see on the Jump Map that the Ice House is marked on the eastern side of Engineers Ravine. The area is also marked as destroyed on the original Jump Map. This was an error on the part of the original aerial photographic interpretation. The Jump Map was known to contain inaccuracies. 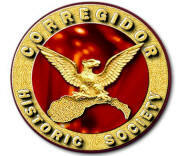 This was because the original prewar Corregidor Maps were not released to the Jump Map cartographers. I've also noticed in some published reports that coordinates were often written with the decimal point in the wrong place, but it is easy enough to correct by looking at the first two whole numbers at the start of the coordinate. ALL MAPS ARE LICENSED TO MEMBERS FOR THEIR EXCLUSIVE, NON-TRANSFERRABLE PERSONAL USE ONLY. FOR ENQUIRIES CONCERNING A COMMERCIAL USE LICENCE, WRITE THE WEBSITE.